Welcome to the Law Office of Camelia Mahmoudi. Ms. Mahmoudi is a Certified Specialist in Estate Planning, Trust & Probate Law from the California State Bar Board of Legal Specialization. Trust & Estate, including conservatorships and guardianships. Probate, including estate and trust administration. Tax: Tax audits and appeals, Tax payment agreements, compromise of tax liabilities. Family Law, involving divorce, property division, child custody and child support, and Conservatorship. We offer professional attention to all our clients. At the Law Office of Camelia Mahmoudi, we make sure that our clients are comfortable with the legal process, and that our clients are not intimidated by the complexity of the legal process. We work with the client to complete the matter with as little expense and litigation as possible. Ms. Mahmoudi was selected as a Northern California “Super Lawyer” by “Super Lawyer” magazine, and San Francisco magazine from 2014 through 2018 and as a “Rising Star” for 2012 and 2013. She also holds an Avvo “Superb” rating. She served as President of the Santa Clara County Estate Planning Council Board of Directors (2015-2016). Currently, she serves on the Santa Clara County Judicial Committee, and Kasner Estate Planning Symposium Planning Committee. She has also been an adjunct professor at Santa Clara University, teaching Business Law, Lincoln School of Law, teaching Elder Law, and De Anza College, teaching Probate Procedures. She is a member of the California State Bar “Taxation” and “Trust and Estates” sections, Santa Clara County Estate Planning Council, Silicon Valley Bar Association and Santa Clara County Bar Association. These honors are the direct result of the way that our law office handles each case. We want our clients to feel confident as they navigate the legal process. That means we equip them with the information they need to make sound decisions. Though there are complex laws that play a role in these cases, our clients are presented with efficient and effective solutions. 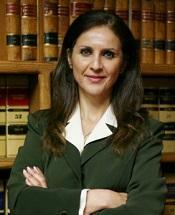 Ms. Mahmoudi is fluent in Farsi, and Italian, and is able to serve clients in such languages as well.